1. A hyperbola is the locus of points where the difference in the distance to two fixed points (called the foci) is constant. 2. A hyperbola is the set of all points (x, y) in the plane the difference of whose distances from two fixed points is some constant. The two fixed points are called the foci. A hyperbola comprises two disconnected curves called its arms or branches which separate the foci. 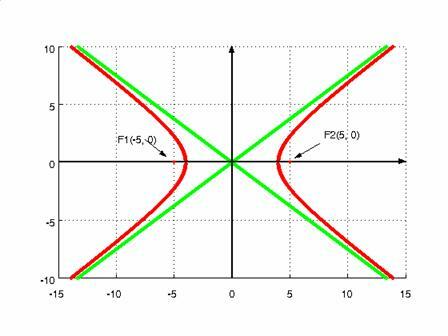 Hyperbola can have a vertical or horizontal orientation. Find: a, b, foci, asymptotes, and eccentricity. Mathematics is a game played according to certain rules with meaningless marks on paper.